The question is not whether you have goals. The question is: do you have real goals? Real goals are written down and involve formulating a detailed plan of attack on how your goals will ultimately be realised. Last but not least, real goals are something you are willing to work towards even when the going gets tough. 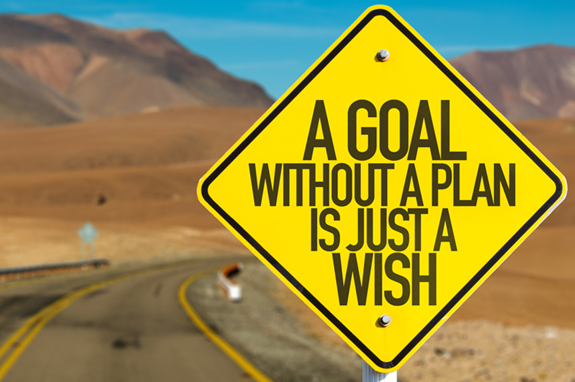 Goal setting doesn’t just relate to business and money. It also plays a huge role in sport. I can’t imagine any elite cycling greats, such as Simon Gerrans, Mathew Hayman or and Richie Porte, not having clearly defined goals. A systematic approach to goal setting is likely the cornerstone of their success. Although these guys are pro athletes we can still learn a lot from how they achieve their goals. We can repurpose the habits of highly successful people to build better outcomes in our own lives. You need to be specific when identifying your goal. “Becoming a better cyclist” is not specific enough to create an action plan around, nor will you know when you have achieved it. A more specific goal could be to “win an A grade criterium” or “ride 300 kilometres per week”. Writing down my goals serves more than one purpose. Firstly, I’m able to formalise the goal and secondly I can place it somewhere where it will be a constant reminder of what I am aiming for. 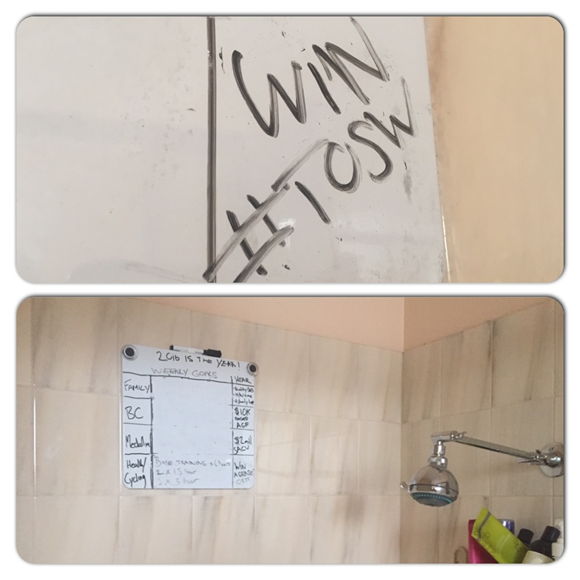 Personally, I have a white board in my shower ($20 from Officeworks) with my goals written down on it. I can see it every single day of the week. Below is an example of my goal last cycling season: to win the Tour of the South West, a B Grade event in the Victorian Road Series. I stared at this whiteboard for four months straight while lathering myself in soap, motivating me to train hard and stick to my guns! I didn’t quite get there, but 2nd place was still a good result in the end. Make sure it’s a goal you truly believe in and know is obtainable. Clarify with yourself why it’s your goal in the first place. What are the reasons for this goal and will those reasons truly propel you to take the necessary actions. Identify the intrinsic (what you do because you enjoy it) and extrinsic (the “award” at the end) motivators attached to your goal. For most cyclists this is ‘time’ but it could be something else. Ensure that you go a level deeper so you really understand what’s potentially going to hinder your ability to meet all the necessary requirements. Knowing these obstacles will enable you to build a plan that is doable for you rather than hopeful. This could be a training group, a coaching company or a group of likeminded cyclists that can help motivate you. Perhaps, like it is for me, your family and friends will also be required to support your training regime. Once you have identified these people, go and communicate your goals with them to gain the support you need. Make sure you educate yourself across a range of domains that could help you achieve your end goal. This may involve researching nutrition, recovery, competitors’ strengths and weaknesses or race tactic ideas. Read blogs, books and speak to experienced club riders as tools to educate yourself on these topics. Steps one to five give you the building blocks to create your recipe for success. You will need to be specific and detailed when going through those steps. Once you have identified your obstacles and educated yourself on what is required to achieve your goal it’s time to put a plan together. This should comprise a combination of structured training and nutritional commitments that can form part of your day-to-day activity. Don’t be afraid to ask for help from people who have “been there, done that” when you’re putting together your plan. Your goal needs a deadline for you to strive towards it. This will create a sense of urgency and importance and also give you a line in the sand to reassess your plan of action at points along the way. If you’re planning an event or a specific race, this one should come easy. If, however, you need to choose your own timeline make sure you understand why that is your decided timeline. Don’t just make it up for the sake of it. It should align back to point 2: “Know why it’s you goal” – that should drive the outcome of your date. Some may read the above and think “that’s all too hard”, however I can personally attest that it is worthwhile. The time spent upfront will free up time and mental space for you to work towards your goal in a systematic and effective way. While the initial process takes some effort, once you’re locked and loaded with a real goal and plan, you’ll be more likely to achieve what you set out to do without delay. This will ultimately save you time in the future! To bring this to life I thought I would share my own personal goal in the same format, which you will find via the link below. This formula will ensure that your goal has some meat on the bone, and isn’t just a fleeting thought that pops into your head from time to time.